Nine-year old Riley Morrison recently sent a hand written letter to Golden State Warriors All-Star Stephen Curry, questioning why his Under Armour Curry 5 sneakers aren't available in girl's sizes. As Riley noted in her letter, the Under Armour site offers a number of Curry 5 colorways for boys, including the option to customize, but there are none for sale under the girl's section. Curry, a father of two daughters, took time to respond to Riley with his own hand written letter, in which he explained that the issue is being taken care of now and that he will be sending her a pair of Curry 5s. 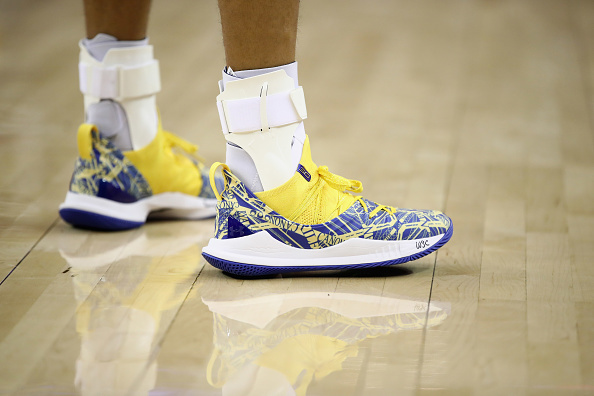 Additionally, the two-time NBA MVP says Riley will be among the first kids to receive the Under Armour Curry 6 and hinted at something special planned for International Women's Day on March 8th. "Hey Riley, I appreciate your concern and have spent the last 2 days talking to Under Armour about how we can fix the issue. Unfortunately, we have labeled smaller sizes as "boys" on the website. We are taking care of this now! I want to make sure you can wear my kicks proudly - so I am going to send you a pair of Curry 5s now AND you'll be one of the first kids to get the Curry 6. Lastly, we have something special in the works for International Women's Day on March 8th, and I want you to celebrate with me! More to come on that, but plan on being in Oakland that night! All the best! #RuinTheGame." Of note, the Warriors will host the Denver Nuggets on March 8. Curry, who has been sidelined with a groin injury, is expected to rejoin the Warriors for their road game in Detroit this Saturday. You can check out Riley's letter to Steph, as well as his response, in the posts embedded below.